The Five Alarm Funk gang digging their way to the centre of the Earth. Photo: Johnny Liu Photography. When the ice cream man comes round the bend, you had best run for the hills. It might just be the end of the world. 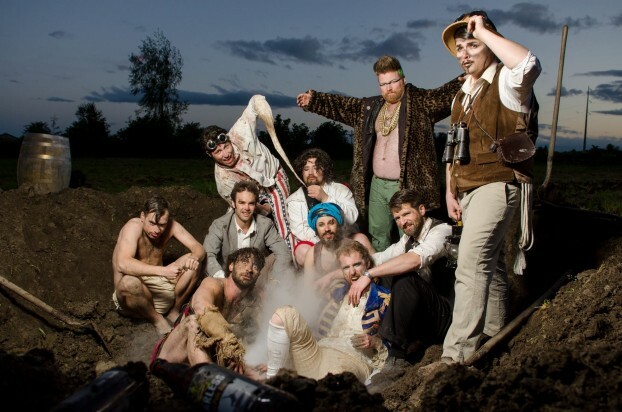 That’s how Five Alarm Funk, Canadian funk-force to be reckoned with, envisions the end of days in their upcoming concept album. The nine track record, due out this fall, will tell the tale of the band’s journey to the centre of the Earth, their devastating ride on the back of a robo-dragon, and the ensuing clash between humanity and the demonic hordes — bookended by encounters with the sinister ice cream man. Whew. A hell of a concept for a funk album, right? The apocalyptic plot started taking shape last summer, dreamt up by the band’s drummer, Tayo Branston, during their cross-country tour. As it turns out, in awesome twist of geekery, the guys kill a lot of time in their tour van playing fantasy games, like Magic Cards and “Lore,” a choose-your-own-adventure RPG. That’s what got Branston’s mind clicking towards an epic fantasy concept album. Joined on set by at times more than forty crew members and volunteers (mainly dancers and extras), the energy levels never dropped below ehem funking high. The “We All Scream” video marks the beginning of a larger, more extravagant multi media tie-in for the concept album. If Branston has his way, over time the video will be expanded into a 45-minute audio visual saga, chronicling the entire wild adventure, complete with animated segments (not only because they’d be cool in an Animatrix-y kind of way, but also because it’s slightly cheaper to animate a robo-dragon than to build one). The band is hoping to get their hands on some grants to help fund the project and may also try crowdfunding on Indiegogo. All this will start to come together in the fall and into 2014. This summer Five Alarm Funk is in full-on tour mode. With thirty tour stops in a month and half, they’ve got a lot on their plate. It’s the busiest tour in the band’s history, and Branston couldn’t be more thoroughly stoked. 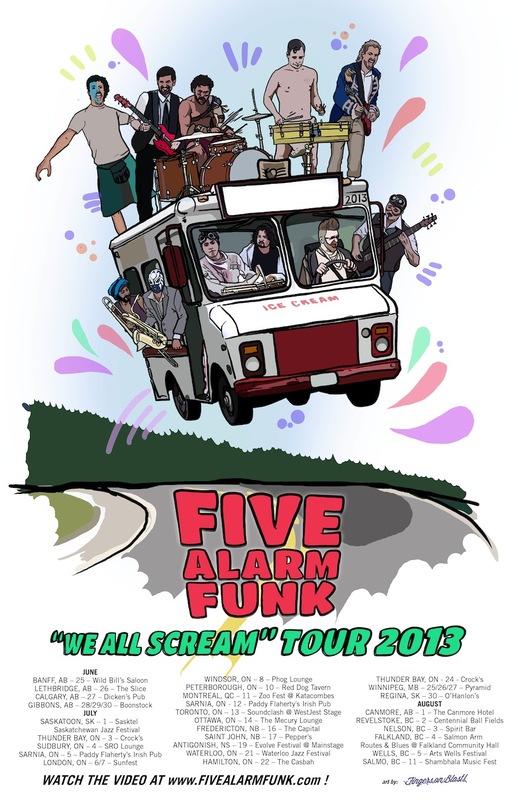 You can catch Five Alarm Funk in Saskatoon on July 1. Their Canada Day performance will officially close the Saskatchewan Jazz Festival Free Stage. The show kicks off at 9:00 pm. Five Alarm Funk turned to their Facebook page a few months ago to outline the first few chapters of their concept album. I’ve copied those five below, and added on two more that Tayo Branston gave me a sneak preview of. In total, we have a good look at eight out of nine of the tracks on the concept album. A deranged ice cream man taints his tasty treats with a cornucopia of psychoactive substances and unleashes the diabolical concoction on the members of Five Alarm Funk. Five Alarm Funk, hell bent on hallucinogens and in a state of chronic psychosis, receive a revelation. Though they do not understand their purpose, they now wholeheartedly believe they must dig deep down into the interior of planet Earth. Equipped with shovels and a stolen ice cream truck converted into a tunnel boring machine, they speed through the Earth’s mantle. A military force tries to intervene but are overpowered by FAF’s savage, drug-fueled ferocity. With the soldiers dispatched, the band can proceed towards their destiny, the Center of the Earth. The great robot is alive, and its power providers are now safely secured within its command center. Thrusters ignite, augers spin ferociously, they cut through rock like it was air as the quest to the crust commences. Upon the Earth’s surface, shamans, seers and psychics alike all start ranting of impending doom and unheralded havoc!! As quick as the predictions come so does the mayhem. An ear-splitting sound and incomprehensible shaking paralyze a northern nation as the gargantuan robot explodes through the Earth’s crust followed by a massive blast of molten magma. Flying at the speed of sound and uncontested by the human’s lowly jet-fighter technology, robot and FAF seek demolition upon the planet by summoning Earth’s great natural disasters! “THUNDER” , “MAGMA” “EARTHQUAKE” , “TORNADO” , “VOLCANO” they scream. The actions are louder than words as a hellstorm of ferocity is unleashed upon humanity. At this point, Five Alarm Funk is riding the giant robot dragon, flying around the Earth erupting volcanos and bringing the unnatural out of the ground. It’s massive war between humanity and the gargoyles [and zombies, banshees, basilisks, sirens, hellhounds, cyclops and ogres] that are coming out of the ground. Meanwhile, FAF rides around the planet on the back of their giant, doomsday robot, in this apocalyptic setting. The robo-dragon unleashes a doomsday device — a giant particle collider at the centre of the Earth. This launches a black hole at the centre of the Earth and starts sucking the world in on itself. Through the eyes of the band, the whole world is collapsing in on itself, and the devastation that has occurred from the band’s journey becomes apparent. The ice cream man is back! His plan to make an ice cream concoction that breaks you down to a place where you no longer you feel you are anything in the world has succeeded, and Five Alarm Funk is still under his spell. He has taken the band on a massive hallucination and they’ve destroyed the world, and are about to destroy themselves. They’ve been reduced to nothing, and now the ice cream man is rebuilding them as his own personal ice cream army. As the band begins to believe they are his ice cream army, they set out to put the rest of the world under the ice cream man’s spell.